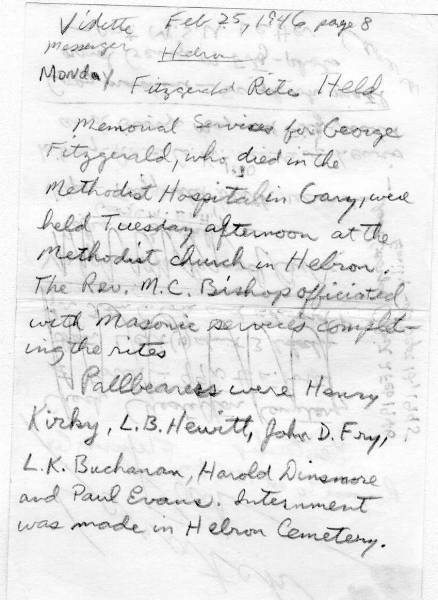 This is the obituary for my great-grandfather, George Maywood Jarrell/Fitzgerald. It was published in the Vidette Messenger in Valparaiso, Indiana on February 25, 1946, page 8. I don’t have a copy of the actual obituary, just this handwritten transcription from my father created circa 1981. Memorial services for George Fitzgerald, who died in the Methodist Hospital on Gary, were held Tuesday afternoon at the Methodist Church in Hebron. The Rev. M. C. Bishop officiated with Masonic services completing the rites. Pallbearers were Henry Kirky, L. B. Hewitt, John D. Fry, L. K. Buchanan, Harold Dinsmore and Paul Evans. Interment was made in Hebron Cemetery. This is the obituary for my 2nd great-grandmother, May (Richards) Fisher. It was published in the Vidette-Messenger, February 25, 1959 on page 6. HEBRON – Mrs. May Fisher, 92, Kouts, died Tuesday night in Porter Memorial hospital where she had been a patient for five weeks. Born Nov. 5, 1866, near Hebron, she was the daughter of Benjamin and Anna (Smith) Richards. She was married Nov. 1, 1898 to W. G. Fisher, who died July 11, 1918. A son, John, also preceded her in death. She had been living with a daughter, Mrs. Jennie Fitzgerald, in Kouts. Surviving are Mrs. Fitzgerald; three sons, Earl of Momence, Ill., Albert of Kouts, and Samuel of Hebron; 17 grandchildren, 17 great-grandchildren and one step-grandchild. Services will be held at 2 pm Friday in phillips Funeral home. The Rev. Robert Pinsky, Hebron Christian church, will officiate, and burial will be in Hebron cemetery. Friends may call from 6:30pm Thursday until services. 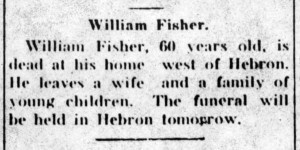 This is the obituary for my 2nd great-grandfather, William Green Fisher. Published July 12, 1918 on page 1 of the Evening Messenger in Hebron, Indiana. 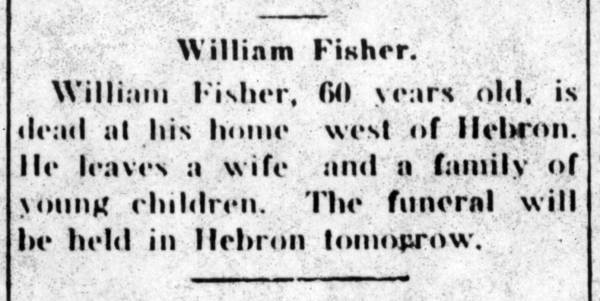 William Fisher, 60 years old, is dead at his home west of Hebron. He leaves a wife and a family of young children. The funeral will be held in Hebron tomorrow. 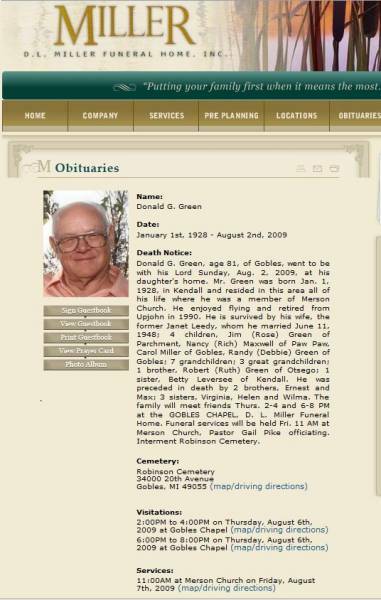 This is the obituary for my husband’s grandfather Max Green’s brother, Donald G. Green. It was published in Kalamazoo Gazette on 8/5/2009. Went to be with his Lord Sunday, Aug. 2, 2009, at his daughter’s home. Mr. Green was born Jan. 1, 1928, in Kendall and resided in this area all of his life where he was a member of Merson Church. He enjoyed flying and retired from Upjohn in 1990. He is survived by his wife, the former Janet Leedy, whom he married June 11, 1948; four children, Jim (Rose) Green of Parchment, Nancy (Rich) Maxwell of Paw Paw, Carol Miller of Gobles, Randy (Debbie) Green of Gobles; seven grandchildren; three great grandchildren; one brother, Robert (Ruth) Green of Otsego; one sister, Betty Leversee of Kendall. Preceded in death by two brothers, Ernest and Max, three sisters Virginia, Helen and Wilma The family will meet friends Thur. 2-4 and 6-8 PM at the GOBLES CHAPEL. Funeral services will be held Friday, 11 AM at Merson Church, Pastor Gail Pike officiating. Interment Robinson Cemetery. This is the obituary for Maria (Oakes, Green) Ford, former wife of Parley Green. Published in the Union and Advertiser in Mumford, New York on May 13, 1886. 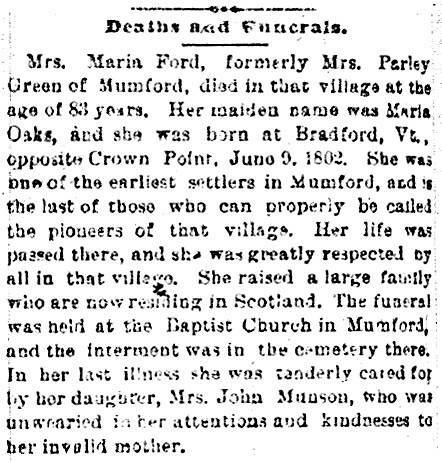 Mrs. Maria Ford, formerly Mrs. Parley Green of Mumford, died in that village at the age of 83 years. Her maiden name was Maria Oaks, and she was born at Bradford, Vt., opposite Crown Point, June 9, 1802. She was one of the earliest settlers in Mumford, and is the last of those who can properly be called the pioneers of that village. Her life was passed there, and she was greatly respected by all in that village. She raised a large family who are now residing in Scotland. The funeral was held at the Baptist Church in Mumford, and the interment was in the cemetery there. In her last illness she was tenderly cared for by her daughter, Mrs. John Munson, who was unwearied in her attentions and kindness to her invalid mother. This is the obituary for my uncle, Walter Dreffs. He was my mother’s brother. 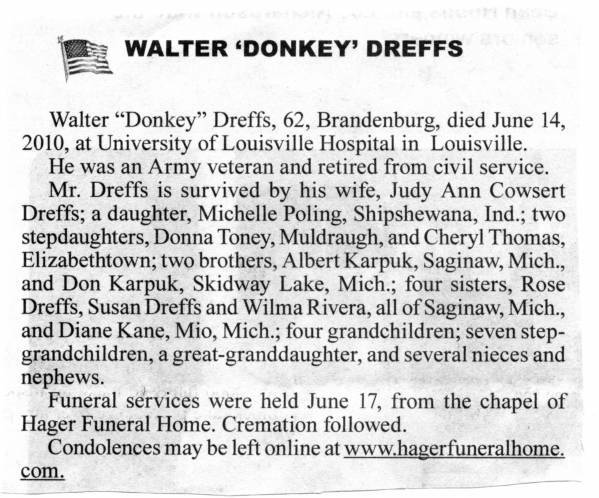 Walter “Donkey” Dreffs, 62, Brandenburg, died June 14, 2010 at University of Louisville Hospital in Louisville. He was an army veteran and retired from civil service. Mr. Dreffs is survived by his wife, Judy Ann Cowsert Dreffs; a daughter, Michelle Poling, Shipshewana, Ind. ; two stepdaughters, Donna Toney, Muldraugh, and Cheryl Thomas, Elizabethtown; two brothers, Albert Karpuk, Saginaw, Mich., and Don Karpuk, Skidway Lake, Mich.; four sisters, Rose Dreffs, Susan Dreffs and Wilma Rivera, all of Saginaw, Mich., and Diane Kane, Mio, Mich.; four grandchildren; seven step-grandchildren, a great-granddaughter, and several nieces and nephews. Funeral services were held June 17, from the chapel of Hager Funeral Home. Cremation followed. Condolences may be left online at www.hagerfuneralhome.com. 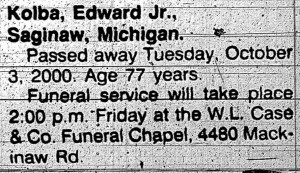 This is the obituary for William John Romaine, published in The Saginaw News in Saginaw, Michigan on Saturday, April 23, 1966 (page A11). William is the son of Alexander Romaine, who was the fourth and final husband of my grandmother Mary Rose Stroik. William passed away in 1966 and his father Alex did not marry my grandmother until 1979. Passed away early Friday evening at Hurley Hospital, Flint, of injuries received in an automobile accident. Age 30 years. He was born June 30, 1935 in Flushing, and attended schools in Saginaw, graduating from Arthur Hill High School in 1965. He was presently attending Delta College. For the past five years he had been employed at the Chevrolet Transmission Plant. He was a member of Zion Lutheran Church. On June 8, 1963, he married Norma Meyerhalt, who survives him. He also leaves one daughter, Tracy Lynn Romaine; also three step-sons and one step-daughter, Barbara A., Karl F., Kenneth A. and Kevin J. Meyerhalt, all at home; his parents, Mr. and Mrs. Alex Romaine, Fosters; one brother and one sister, James Romaine, Grand Rapids; Mrs. Earl Campbell, Saginaw. Funeral announcement will be made later by the Case Chapel, 409 Adams St. Friends may call at the chapel after 7 p.m. Sunday. 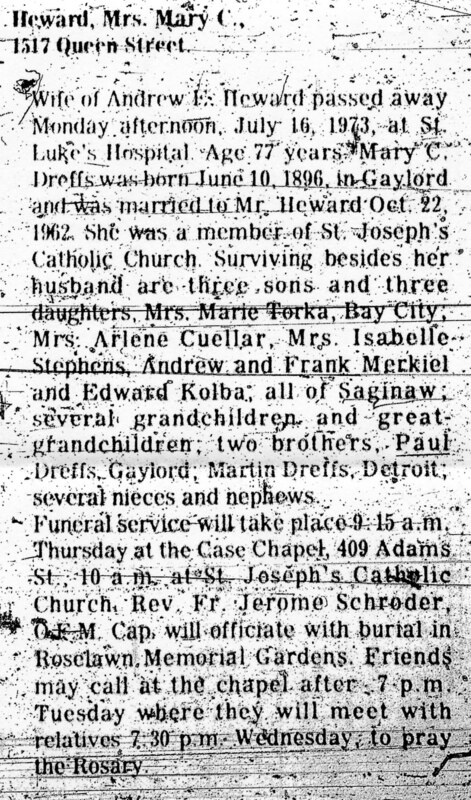 This is an obituary for my grandfather Walter Anthony Dreffs’ sister, Mary C. (Dreffs, Kolba) Heward. 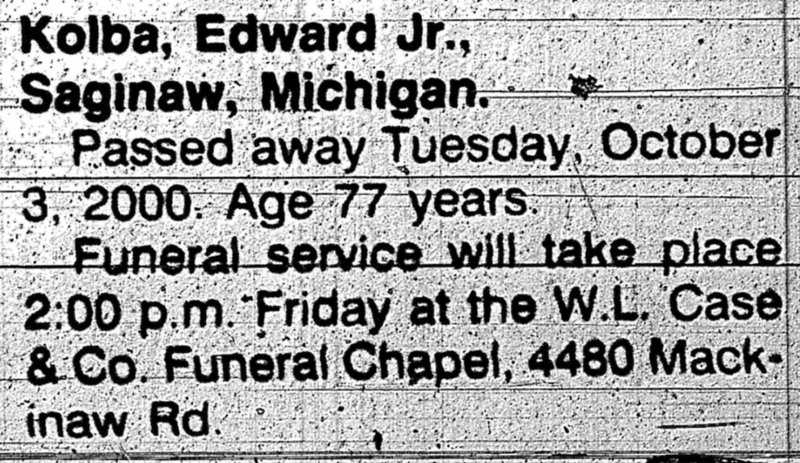 It was published in The Saginaw News in Saginaw, Michigan on Tuesday, July 17, 1973 (page A5). Wife of Andrew E. Heward passed away Monday afternoon, July 16, 1973 at St. Luke’s Hospital. Age 77 years. 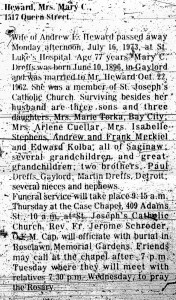 Mary C. Dreffs was born June 10, 1896, in Gaylord and was married to Mr. Heward Oct. 22, 1962. She was a member of St. Joseph’s Catholic Church. 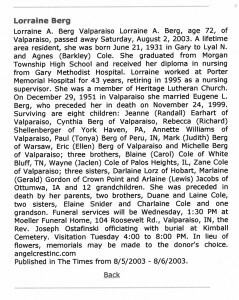 Surviving besides her husband are three sons and three daughters, Mrs. Marie Torka, Bay City; Mrs. Arlene Cuellar, Mrs. Isabelle Stephens, Andrew and Frank Merkiel and Edward Kolba; all of Saginaw; several grandchildren and great-grandchildren; two brothers, Paul Dreffs, Daylord; Martin Dreffs, Detroit; several nieces and nephews. Funeral service will take place 9:15 a.m. Thursday at the Case Chapel, 409 Adams St., 10 a. m. at St Joseph’s Catholic Church, Rev. Fr. Jerome Schroder, O. F. M. Cap. will officiate with burial in Roselawn Memorial Gardens. Friends may call at the chapel after 7 p. m. Tuesday where they will meet with relatives 7:30 p.m. Wednesday to pray the Rosary. This is the obituary for Edward Kolba, Junior. He is the son of Mary C. (Dreffs) Heward, the sister of my grandfather Walter Anthony Dreffs. This was published in The Saginaw News on October 5, 2000 on page C11. I was really hoping this obituary would provide more information about him. Passed away Tuesday, October 3, 2000. Age 77 years. Funeral service will take place 2:00 p.m. Friday at the W. L. Case & Co. Funeral Chapel, 4480 Mackinaw Rd. 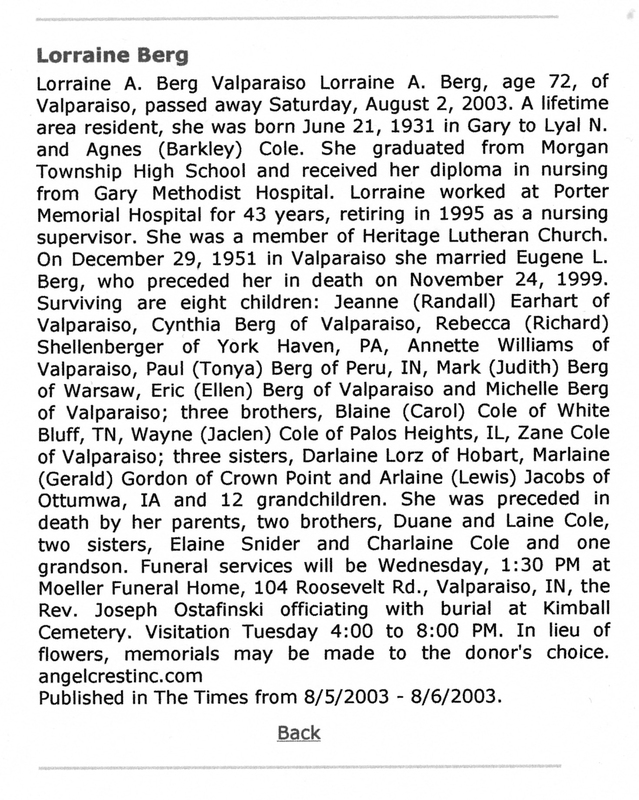 Obituary for my grand Aunt, Lorraine Berg, published in The Times, Valparaiso, Indiana on August 5, 2003. Check out my Ancestry Family Tree for Lorraine Berg. See the grave of Lorraine Berg on Find A Grave.